On April 8th, Kill Rock Stars will release Colin Meloy Sings Live! 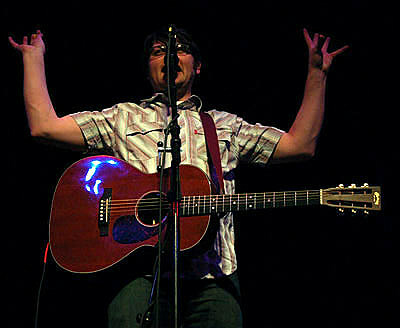 – a 14-song set documenting The Decemberists’ lead singer/songwriter’s 2006 solo tour. Meloy’s two-week trek across the U.S. coincided with the release of Colin Meloy Sings Shirley Collins, his six-song EP paying homage to the revered British folksinger. While the latter collection (and its predecessor, Colin Meloy Sings Morrissey) were only sold on tour, Colin Meloy Sings Live! will be available at retail in both CD and double-gatefold LP configurations. I also hear that Colin will be supporting the new album with another solo tour sometime around the release date, which I guess also means that the cancelled Decemberists tour won’t be rescheduled for any time soon. The Decemberists only have four currently scheduled dates – 2 in Oregon, and 2 in Washington. (those kick off tonight, dates below). Laura Veirs opened for Colin back on that 2006 tour, and she was supposed to open for the Decemberists on some of those cancelled dates. In the future she’s playing Union Hall in Brooklyn on January 27th, and then touring Europe. All dates below….